Beavers are constantly grooming and oiling their fur to waterproof it. Typically when grooming, a beaver sits upright with its tail curled under its body and extended in front of it between its two hind legs. This allows the cloaca (an opening which contains ducts for everything from evacuation to reproduction, plus oil and castoreum glands) to be exposed. The beaver uses its front feet to retrieve creamy-yellow waterproofing oil from its inverted oil glands and then rubs it carefully over all of its body. Without constant waterproofing the beaver’s fur would soon become soaking wet and the beaver would not be able to tolerate the cold water. This entry was posted on July 2, 2012 by Mary Holland. 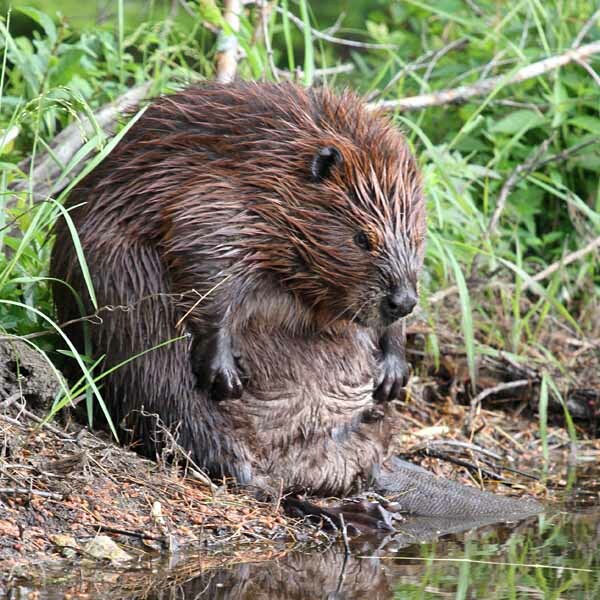 It was filed under Adaptations, Beavers, July, Mammals and was tagged with Adaptations, Beaver, Beaver Grooming, Castor canadensis, Cloaca, Grooming, mammals, Oil Glands, Waterproofing Fur. What an awesome photo! Part of the constant “busy-ness” of a beaver’s life!